There’s a great Asian market right around the corner from Zak’s office, so from time to time he stops to pick up a few things on his lunch hour. Last week, he came home bearing some really awesome gifts – duck wings! After some Googling around, I settled on using my new Le Creuset french oven to confit them. Because I didn’t have any duck fat laying around and didn’t feel like traveling from store to store in search of some, I decided to use olive oil. I followed Michael Ruhlman‘s recipe because, well, he’s awesome and a fellow Clevelander. I stuck to it pretty much to a tee, and ended up with flavorful and crispy duck wings that stood up beautifully to the bold flavors of this salad. 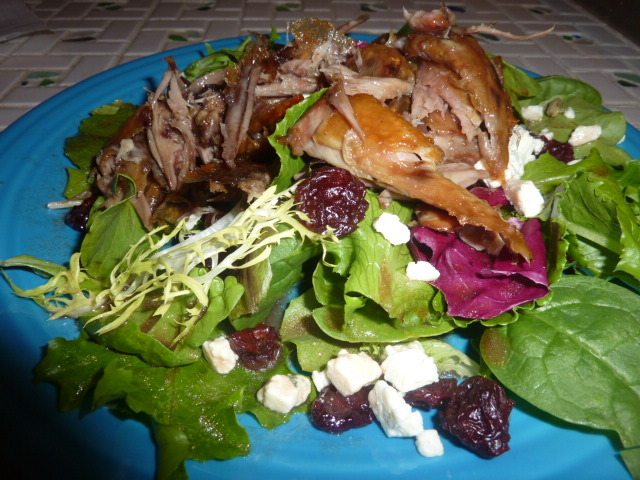 Duck, cherries and blue cheese tossed with some mixed greens and drizzled with a tart pomegranate vinaigrette. Seriously, yum. I ate this exact same salad twice in a row and was craving it again. Be aware that the duck wings do not yield a whole heck of a lot of meat. I used these six wings to make two hearty salads and didn’t have any left over because it only yielded about a cup and a half of meat and skins, max (though I will be making a duck stock with the bones!). Sprinkle the duck pieces all over with salt. Use a generous amount – 2 tbs. or so – as though you are salting a roast chicken or thick steak. Roughly chop cloves, peppercorns, and garlic. Place half of clove/peppercorn/garlic mixture on a large sheet of saran wrap. Lay duck pieces over top. Place a small piece of bay leaf on each duck wing. Sprinkle remainder of clove mixture over the duck. Wrap very tightly in saran wrap and then place in a plastic bag. Refrigerate overnight or up to 48 hours. Place legs in an oven safe pot or dutch oven. Cover with olive oil (several cups). Bring to a simmer over medium-high heat. Immediately transfer (CAREFULLY) uncovered to the low oven. Cook for 6-10 hours until the legs are completely tender, the fat clear, and the legs resting on the bottom of the pan. Remove from the oven. Cool, submerged in olive oil, to room temperate. Transfer to refrigerator and refrigerate for up to one month (or perhaps longer, depending on where you get your information). When you desire to serve, remove the container from the refrigerator and bring to room temperature. Transfer wings to a tinfoil lined baking sheet. Bake in oven, turning once, for 15-25 minutes until the meat is warmed through and the skin is crispy. Remove from oven and remove the meat and skin from the bones of the duck. Shred and serve warm, keeping warm in an oven if necessary. Toss together cherries, crumbled blue cheese, and lettuce. Top with duck and drizzle with vinaigrette. Whisk together ingredients until well combined. I love Cleveland. There’s nothing like an incredibly unexpected spring day. I decided to make something that wouldn’t require the use of the oven when the temperatures rose near 70 degrees the other day (only to sink back into the 30s just in time for spring break). 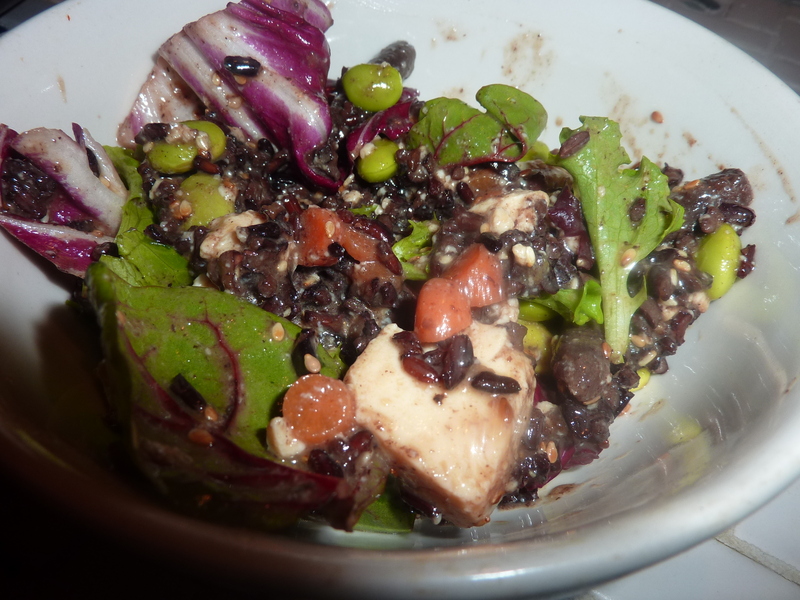 This wild rice salad has an excellent balance of flavors and textures – creamy tofu, nutty rice, earthy tahini, salty miso, bright citrus, and crunchy carrots and edamame. If you want to make this vegan, simply swap out the chicken stock for vegetable stock or water. I enjoyed the extra depth of savory flavor the chicken stock provided, but I’m sure this would be absolutely delicious with just water. This is an excellent week night meal because it comes together quite quickly – especially because you can make the rice ahead of time. Add rice, chicken stock, and baby carrots to a medium sauce pan. Bring to a boil. Cover and immediately reduce heat to low and simmer for 50 minutes or as long as your package instructs. Meanwhile, whisk together tahini, soy sauce, vinegar and freshly ground black pepper. Toss with tofu and let marinate as rice cooks. As tofu is marinating, heat a small sauté pan over medium heat. Add sesame seeds and cook, tossing frequently, until lightly toasted. Remove from heat and set aside. 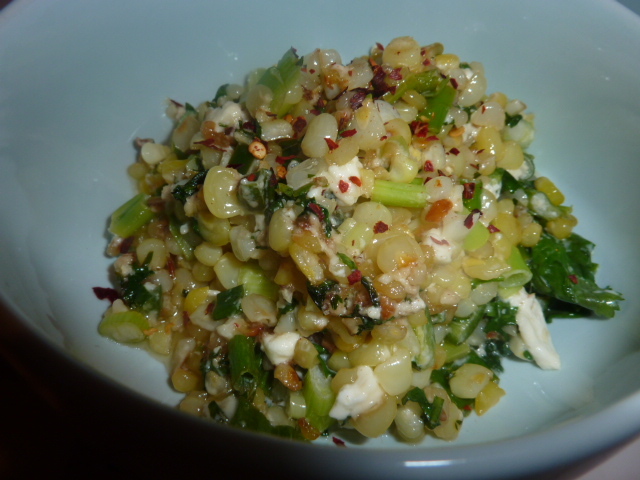 Once rice is cooked, toss together all ingredients, including miso dressing (see below). 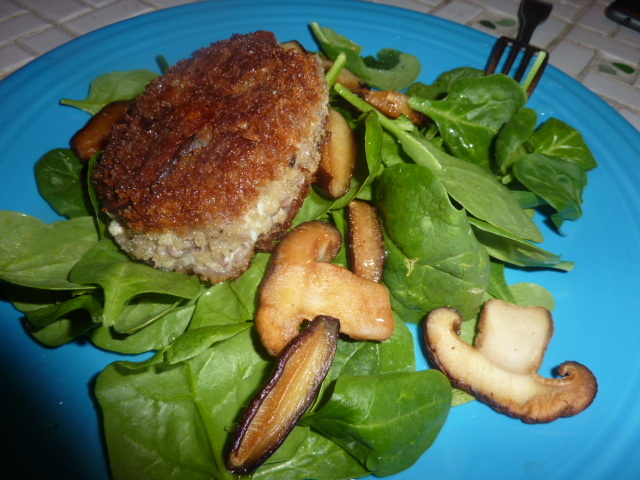 This meal was incredibly simple, delicious, flavorful, and healthy. The succulent and moist flesh of the fish absorbed the subtle flavors of ginger, soy and lemongrass. 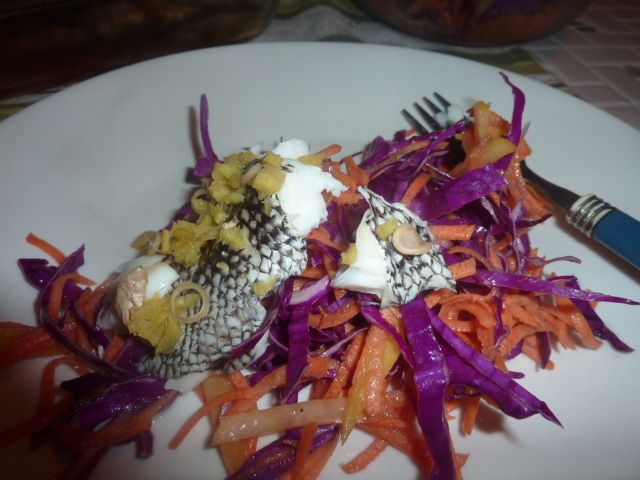 The coleslaw was a lovely mix of bright and fresh ingredients, playing well with the fish. I served the fish along with the drippings that accumulated at the bottom of the pan for a delicious, subtle-flavored dipping sauce. Between the fish and the coleslaw, this dish had about fifteen minutes of hands-on time – making it one of the easiest and fastest dinners I can think of. It’s also absolutely gorgeous – the coleslaw is especially striking when you see it next to the whole fish. Pat fish dry with towels and cut two shallow slices in each side of the fish. Season both sides of fish and cavity of fish lightly with kosher salt. Stuff half of lemon grass and half of ginger into the cavity of the fish. Place the fish in a baking dish large enough to hold it. Make sure the dish can fit into your roasting pan. Mix together half of the soy sauce and half of the rice wine vinegar. Pour over fish. Sprinkle remaining half of ginger and lemongrass on top of the fish. Fill up the roasting pan with enough water to come halfway up to the baking dish. Transfer water to a sauce pan and bring to a boil with remaining half of soy sauce, rice wine vinegar, and whole black peppercorns. Transfer boiling water back to the roasting pan. Add baking dish to the roasting pan. Oil a piece of tinfoil. Cover roasting pan snugly with the tinfoil, oiled side down. Transfer to the oven and bake 25-30 minutes until flesh of fish flakes easily with a fork and is opaque or 145º. Whisk together vinegar, oil, and soy sauce. Season with freshly cracked black pepper. Add to vegetables and toss thoroughly to combine. Let sit 6-8 hours, refrigerated, to allow flavors to meld.